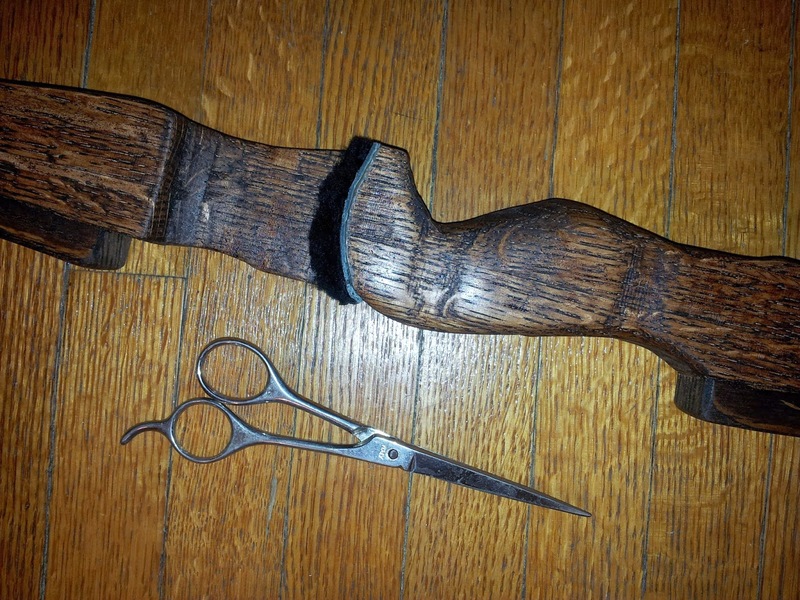 My longbow is done drying from its Red Mahogany polyurethane application and so it is now time to add a traditional arrowrest to the arrow shelf of my bow. 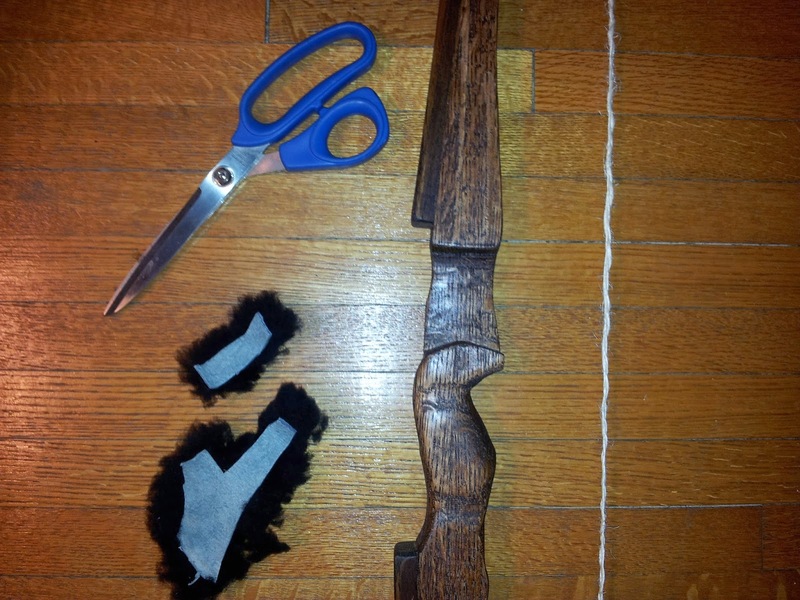 When shooting off a shelf many archers prefer to pad the arrow shelf with a piece of fur or similar material so that it is softer on the arrow and fletching as it goes over the arrow rest. 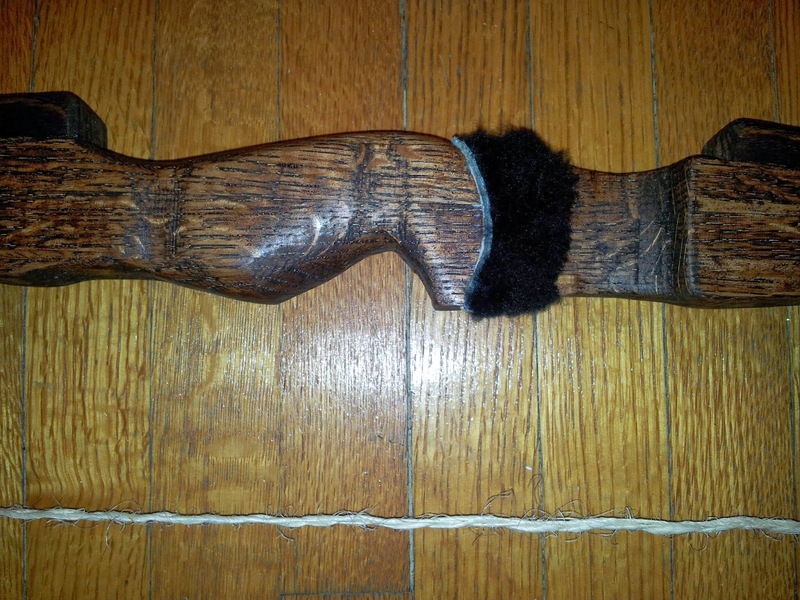 Myself, I have opted for sheepskin - because it is what I have in the house, having previously used sheepskin on a different bow to make dampeners. 1. First I cut out a piece of sheepskin that is approx. the size of my arrow shelf. 2. 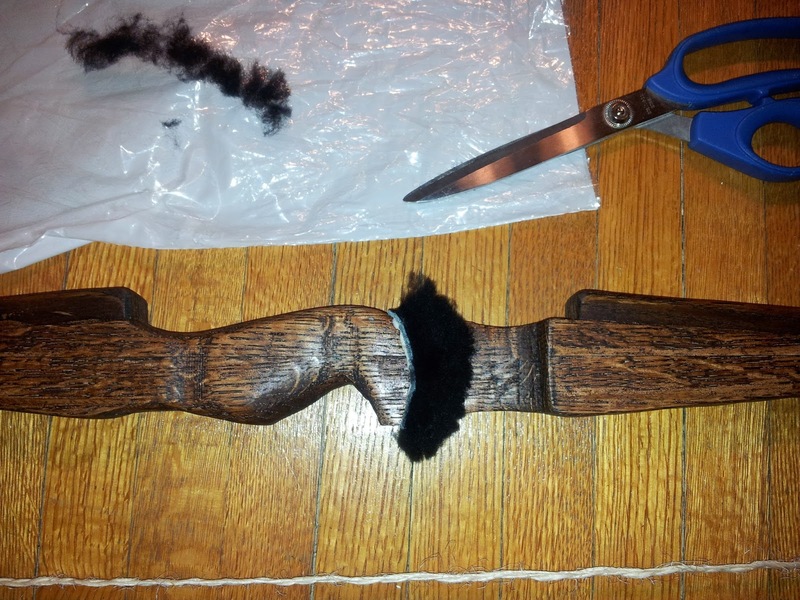 Then I glue the back of the sheepskin and the surface of the arrow shelf. 3. Affix it to arrow rest. 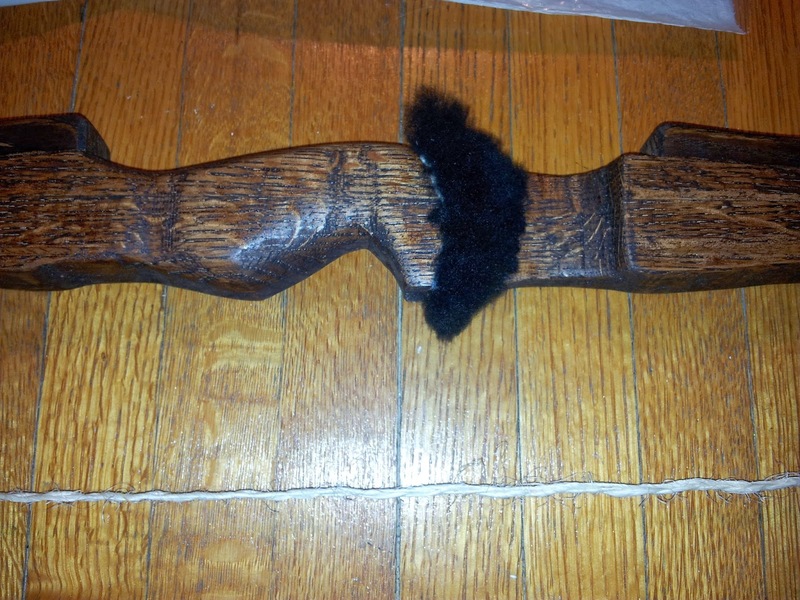 Hence my comment about my longbow having a bushy mustache. 4. Trim off the left side of the mustache, so it looks better. 5. 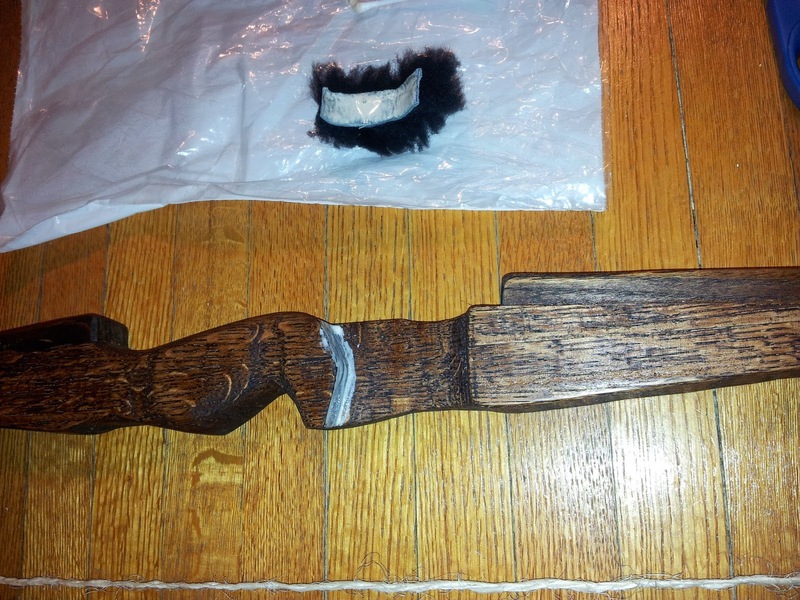 Trim off the front and back of the arrow rest, so it looks even cleaner. 6. Sheepskin wool is rather thick so I will later go back and trim it down to 1 cm or less, but for now I am going to let the glue dry (I used Titebond III wood glue, so it should be dry in 12 hours or less). After it is dry I will trim it down even more and post another photo up here of the finished product. I am planning to be outside shooting this bow this weekend. I have already shot it in the garage, but I am hoping to shoot it a lot more (and further distances) when I practice with it this weekend.